This article is about the family of languages found in much of Europe and Asia. For other uses, see Indo-European. The Indo-European languages are a language family of several hundred related languages and dialects. There are about 445 living Indo-European languages, according to the estimate by Ethnologue, with over two thirds (313) of them belonging to the Indo-Iranian branch. The Indo-European languages with the greatest numbers of native speakers are Spanish, English, Hindustani (Hindi-Urdu), Portuguese, Bengali, Punjabi, and Russian, each with over 100 million speakers, with German, French, Marathi, Italian, and Persian also having more than 50 million. Today, nearly 42% of the human population (3.2 billion) speaks an Indo-European language as a first language, by far the highest of any language family. The Indo-European family includes most of the modern languages of Europe; notable exceptions include Hungarian, Turkish, Finnish, Estonian, Basque, Maltese, and Sami. The Indo-European family is also represented in Asia with the exception of East and Southeast Asia. It was predominant in ancient Anatolia (present-day Turkey), the ancient Tarim Basin (present-day Northwest China) and most of Central Asia until the medieval Turkic and Mongol invasions. Outside Eurasia, Indo-European languages are dominant in the Americas and much of Oceania and Africa, having reached there during the Age of Discovery and later periods. Indo-European languages are also most commonly present as minority languages or second languages in countries where other families are dominant. With written evidence appearing since the Bronze Age in the form of the Anatolian languages and Mycenaean Greek, the Indo-European family is significant to the field of historical linguistics as possessing the second-longest recorded history, after the Afroasiatic family, although certain language isolates, such as Sumerian, Elamite, Hurrian, Hattian, and Kassite are recorded earlier. All Indo-European languages are descendants of a single prehistoric language, reconstructed as Proto-Indo-European, spoken sometime in the Neolithic era. Although no written records remain, aspects of the culture and religion of the Proto-Indo-Europeans can also be reconstructed from the related cultures of ancient and modern Indo-European speakers who continue to live in areas to where the Proto-Indo-Europeans migrated from their original homeland. Several disputed proposals link Indo-European to other major language families. Although they are written in Semitic Old Assyrian, the Hittite loanwords and names found in the Kültepe texts are the oldest record of any Indo-European language. During the nineteenth century, the linguistic concept of Indo-European languages was frequently used interchangeably with the racial concepts of Aryan and Japhetite. In the 16th century, European visitors to the Indian subcontinent began to notice similarities among Indo-Aryan, Iranian, and European languages. In 1583, English Jesuit missionary and Konkani scholar Thomas Stephens wrote a letter from Goa to his brother (not published until the 20th century) in which he noted similarities between Indian languages and Greek and Latin. Another account was made by Filippo Sassetti, a merchant born in Florence in 1540, who travelled to the Indian subcontinent. Writing in 1585, he noted some word similarities between Sanskrit and Italian (these included devaḥ/dio "God", sarpaḥ/serpe "serpent", sapta/sette "seven", aṣṭa/otto "eight", and nava/nove "nine"). However, neither Stephens' nor Sassetti's observations led to further scholarly inquiry. In 1647, Dutch linguist and scholar Marcus Zuerius van Boxhorn noted the similarity among certain Asian and European languages and theorized that they were derived from a primitive common language which he called Scythian. He included in his hypothesis Dutch, Albanian, Greek, Latin, Persian, and German, later adding Slavic, Celtic, and Baltic languages. However, Van Boxhorn's suggestions did not become widely known and did not stimulate further research. Franz Bopp, pioneer in the field of comparative linguistic studies. Ottoman Turkish traveler Evliya Çelebi visited Vienna in 1665–1666 as part of a diplomatic mission and noted a few similarities between words in German and in Persian. Gaston Coeurdoux and others made observations of the same type. Coeurdoux made a thorough comparison of Sanskrit, Latin and Greek conjugations in the late 1760s to suggest a relationship among them. Meanwhile, Mikhail Lomonosov compared different language groups, including Slavic, Baltic ("Kurlandic"), Iranian ("Medic"), Finnish, Chinese, "Hottentot" (Khoekhoe), and others, noting that related languages (including Latin, Greek, German and Russian) must have separated in antiquity from common ancestors. Thomas Young first used the term Indo-European in 1813, deriving from the geographical extremes of the language family: from Western Europe to North India. A synonym is Indo-Germanic (Idg. or IdG. ), specifying the family's southeasternmost and northwesternmost branches. This first appeared in French (indo-germanique) in 1810 in the work of Conrad Malte-Brun; in most languages this term is now dated or less common than Indo-European, although in German indogermanisch remains the standard scientific term. A number of other synonymous terms have also been used. Franz Bopp wrote in 1816 On the conjugational system of the Sanskrit language compared with that of Greek, Latin, Persian and Germanic and between 1833 and 1852 he wrote Comparative Grammar. This marks the beginning of Indo-European studies as an academic discipline. The classical phase of Indo-European comparative linguistics leads from this work to August Schleicher's 1861 Compendium and up to Karl Brugmann's Grundriss, published in the 1880s. Brugmann's neogrammarian reevaluation of the field and Ferdinand de Saussure's development of the laryngeal theory may be considered the beginning of "modern" Indo-European studies. The generation of Indo-Europeanists active in the last third of the 20th century (such as Calvert Watkins, Jochem Schindler, and Helmut Rix) developed a better understanding of morphology and of ablaut in the wake of Kuryłowicz's 1956 Apophony in Indo-European, who in 1927 pointed out the existence of the Hittite consonant ḫ. Kuryłowicz's discovery supported Ferdinand de Saussure's 1879 proposal of the existence of coefficients sonantiques, elements de Saussure reconstructed to account for vowel length alternations in Indo-European languages. This led to the so-called laryngeal theory, a major step forward in Indo-European linguistics and a confirmation of de Saussure's theory. Albanian, attested from the 13th century AD; Proto-Albanian has evolved from an ancient Paleo-Balkan language, traditionally thought to be Illyrian, however, the evidence supporting this is still insufficient. Anatolian, extinct by Late Antiquity, spoken in Asia Minor, attested in isolated terms in Luwian/Hittite mentioned in Semitic Old Assyrian texts from the 20th and 19th centuries BC, Hittite texts from about 1650 BC. Armenian, attested from the early 5th century AD. Balto-Slavic, believed by most Indo-Europeanists to form a phylogenetic unit, while a minority ascribes similarities to prolonged language-contact. Slavic (from Proto-Slavic), attested from the 9th century AD (possibly earlier), earliest texts in Old Church Slavonic. Slavic languages include Bulgarian, Russian, Polish, Czech, Slovak, Montenegrin, Macedonian, Bosnian, Croatian, Serbian, Slovenian, Ukrainian, Belarusian, and Rusyn. Baltic, attested from the 14th century AD; for languages first attested that recently, they retain unusually many archaic features attributed to Proto-Indo-European (PIE). Living examples are Lithuanian and Latvian. Celtic (from Proto-Celtic), attested since the 6th century BC; Lepontic inscriptions date as early as the 6th century BC; Celtiberian from the 2nd century BC; Primitive Irish Ogham inscriptions from the 4th or 5th century AD, earliest inscriptions in Old Welsh from the 7th century AD. Modern Celtic languages include Welsh, Cornish, Breton, Scots Gaelic, Irish Gaelic and Manx. Germanic (from Proto-Germanic), earliest attestations in runic inscriptions from around the 2nd century AD, earliest coherent texts in Gothic, 4th century AD. Old English manuscript tradition from about the 8th century AD. Includes English, Frisian, German, Dutch, Danish, Swedish, Norwegian, Afrikaans, Yiddish, Low German, Icelandic and Faroese. Hellenic and Greek (from Proto-Greek, see also History of Greek); fragmentary records in Mycenaean Greek from between 1450 and 1350 BC have been found. Homeric texts date to the 8th century BC. Indo-Iranian, attested circa 1400 BC, descended from Proto-Indo-Iranian (dated to the late 3rd millennium BC). Indo-Aryan (including Dardic), attested from around 1400 BC in Hittite texts from Asia Minor, showing traces of Indo-Aryan words. Epigraphically from the 3rd century BC in the form of Prakrit (Edicts of Ashoka). The Rigveda is assumed to preserve intact records via oral tradition dating from about the mid-second millennium BC in the form of Vedic Sanskrit. Includes a wide range of modern languages from Northern India, Southern Pakistan and Bangladesh including Hindustani, Bengali, Assamese, Punjabi, Kashmiri, Gujarati, Marathi, Odia and Nepali as well as Sinhala of Sri Lanka. Italic (from Proto-Italic), attested from the 7th century BC. Includes the ancient Osco-Umbrian languages, Faliscan, as well as Latin and its descendants (the Romance languages). Tocharian, with proposed links to the Afanasevo culture of Southern Siberia. Extant in two dialects (Turfanian and Kuchean, or Tocharian A and B), attested from roughly the 6th to the 9th century AD. Marginalized by the Old Turkic Uyghur Khaganate and probably extinct by the 10th century. Ligurian – possibly close to or part of Celtic. Ancient Macedonian: proposed relationship to Greek. Sicel: an ancient language spoken by the Sicels (Greek Sikeloi, Latin Siculi), one of the three indigenous (i.e. pre-Greek and pre-Punic) tribes of Sicily. Proposed relationship to Latin or proto-Illyrian (Pre-Indo-European) at an earlier stage. Venetic: shares several similarities with Latin and the Italic languages, but also has some affinities with other IE languages, especially Germanic and Celtic. Membership of languages in the Indo-European language family is determined by genealogical relationships, meaning that all members are presumed descendants of a common ancestor, Proto-Indo-European. Membership in the various branches, groups and subgroups of Indo-European is also genealogical, but here the defining factors are shared innovations among various languages, suggesting a common ancestor that split off from other Indo-European groups. For example, what makes the Germanic languages a branch of Indo-European is that much of their structure and phonology can be stated in rules that apply to all of them. Many of their common features are presumed innovations that took place in Proto-Germanic, the source of all the Germanic languages. The "tree model" is considered an appropriate representation of the genealogical history of a language family if communities do not remain in contact after their languages have started to diverge. In this case, subgroups defined by shared innovations form a nested pattern. The tree model is not appropriate in cases where languages remain in contact as they diversify; in such cases subgroups may overlap, and the "wave model" is a more accurate representation. Most approaches to Indo-European subgrouping to date have assumed that the tree model is by-and-large valid for Indo-European; however, there is also a long tradition of wave-model approaches. In addition to genealogical changes, many of the early changes in Indo-European languages can be attributed to language contact. It has been asserted, for example, that many of the more striking features shared by Italic languages (Latin, Oscan, Umbrian, etc.) might well be areal features. More certainly, very similar-looking alterations in the systems of long vowels in the West Germanic languages greatly postdate any possible notion of a proto-language innovation (and cannot readily be regarded as "areal", either, because English and continental West Germanic were not a linguistic area). In a similar vein, there are many similar innovations in Germanic and Balto-Slavic that are far more likely areal features than traceable to a common proto-language, such as the uniform development of a high vowel (*u in the case of Germanic, *i/u in the case of Baltic and Slavic) before the PIE syllabic resonants *ṛ,* ḷ, *ṃ, *ṇ, unique to these two groups among IE languages, which is in agreement with the wave model. The Balkan sprachbund even features areal convergence among members of very different branches. An extension to the Ringe-Warnow model of language evolution, suggests that early IE had featured limited contact between distinct lineages, with only the Germanic subfamily exhibiting a less treelike behaviour as it acquired some characteristics from neighbours early in its evolution. The internal diversification of especially West Germanic is cited to have been radically non-treelike. Specialists have postulated the existence of higher-order subgroups such as Italo-Celtic, Graeco-Armenian, Graeco-Aryan or Graeco-Armeno-Aryan, and Balto-Slavo-Germanic. However, unlike the ten traditional branches, these are all controversial to a greater or lesser degree. The Italo-Celtic subgroup was at one point uncontroversial, considered by Antoine Meillet to be even better established than Balto-Slavic. The main lines of evidence included the genitive suffix -ī; the superlative suffix -m̥mo; the change of /p/ to /kʷ/ before another /kʷ/ in the same word (as in penkʷe > *kʷenkʷe > Latin quīnque, Old Irish cóic); and the subjunctive morpheme -ā-. This evidence was prominently challenged by Calvert Watkins; while Michael Weiss has argued for the subgroup. Evidence for a relationship between Greek and Armenian includes the regular change of the second laryngeal to a at the beginnings of words, as well as terms for "woman" and "sheep". Greek and Indo-Iranian share innovations mainly in verbal morphology and patterns of nominal derivation. Relations have also been proposed between Phrygian and Greek, and between Thracian and Armenian. Some fundamental shared features, like the aorist (a verb form denoting action without reference to duration or completion) having the perfect active particle -s fixed to the stem, link this group closer to Anatolian languages and Tocharian. Shared features with Balto-Slavic languages, on the other hand (especially present and preterit formations), might be due to later contacts. The Indo-Hittite hypothesis proposes that the Indo-European language family consists of two main branches: one represented by the Anatolian languages and another branch encompassing all other Indo-European languages. Features that separate Anatolian from all other branches of Indo-European (such as the gender or the verb system) have been interpreted alternately as archaic debris or as innovations due to prolonged isolation. Points proffered in favour of the Indo-Hittite hypothesis are the (non-universal) Indo-European agricultural terminology in Anatolia and the preservation of laryngeals. However, in general this hypothesis is considered to attribute too much weight to the Anatolian evidence. According to another view, the Anatolian subgroup left the Indo-European parent language comparatively late, approximately at the same time as Indo-Iranian and later than the Greek or Armenian divisions. A third view, especially prevalent in the so-called French school of Indo-European studies, holds that extant similarities in non-satem languages in general—including Anatolian—might be due to their peripheral location in the Indo-European language-area and to early separation, rather than indicating a special ancestral relationship. Hans J. Holm, based on lexical calculations, arrives at a picture roughly replicating the general scholarly opinion and refuting the Indo-Hittite hypothesis. Some significant isoglosses in Indo-European daughter languages at around 500 BC. The division of the Indo-European languages into satem and centum groups was put forward by Peter von Bradke in 1890, although Karl Brugmann had proposed a similar type of division in 1886. In the satem languages, which include the Balto-Slavic and Indo-Iranian branches, as well as (in most respects) Albanian and Armenian, the reconstructed Proto-Indo-European palatovelars remained distinct and were fricativized, while the labiovelars merged with the "plain velars". In the centum languages, the palatovelars merged with the plain velars, while the labiovelars remained distinct. The results of these alternative developments are exemplified by the words for "hundred" in Avestan (satem) and Latin (centum)—the initial palatovelar developed into a fricative [s] in the former, but became an ordinary velar [k] in the latter. Rather than being a genealogical separation, the centum–satem division is commonly seen as resulting from innovative changes that spread across PIE dialect-branches over a particular geographical area; the centum–satem isogloss intersects a number of other isoglosses that mark distinctions between features in the early IE branches. It may be that the centum branches in fact reflect the original state of affairs in PIE, and only the satem branches shared a set of innovations, which affected all but the peripheral areas of the PIE dialect continuum. Kortlandt proposes that the ancestors of Balts and Slavs took part in satemization before being drawn later into the western Indo-European sphere. Objections to such groupings are not based on any theoretical claim about the likely historical existence or non-existence of such macrofamilies; it is entirely reasonable to suppose that they might have existed. The serious difficulty lies in identifying the details of actual relationships between language families, because it is very hard to find concrete evidence that transcends chance resemblance, or is not equally likely explained as being due to borrowing (including Wanderwörter, which can travel very long distances). Because the signal-to-noise ratio in historical linguistics declines steadily over time, at great enough time-depths it becomes open to reasonable doubt that one can even distinguish between signal and noise. Scheme of Indo-European migrations from ca. 4000 to 1000 BC according to the Kurgan hypothesis. The proposed Proto-Indo-European language (PIE) is the reconstructed common ancestor of the Indo-European languages, spoken by the Proto-Indo-Europeans. From the 1960s, knowledge of Anatolian became certain enough to establish its relationship to PIE. Using the method of internal reconstruction an earlier stage, called Pre-Proto-Indo-European, has been proposed. PIE was an inflected language, in which the grammatical relationships between words were signaled through inflectional morphemes (usually endings). The roots of PIE are basic morphemes carrying a lexical meaning. By addition of suffixes, they form stems, and by addition of endings, these form grammatically inflected words (nouns or verbs). The reconstructed Indo-European verb system is complex and, like the noun, exhibits a system of ablaut. The diversification of the parent language into the attested branches of daughter languages is historically unattested. The timeline of the evolution of the various daughter languages, on the other hand, is mostly undisputed, quite regardless of the question of Indo-European origins. 1500–1000 BC: The Nordic Bronze Age develops pre-Proto-Germanic, and the (pre)-Proto-Celtic Urnfield and Hallstatt cultures emerge in Central Europe, introducing the Iron Age. Migration of the Proto-Italic speakers into the Italian peninsula (Bagnolo stele). Redaction of the Rigveda and rise of the Vedic civilization in the Punjab. The Mycenaean civilization gives way to the Greek Dark Ages. Hittite goes extinct. 1000–500 BC: The Celtic languages spread over Central and Western Europe. Baltic languages are spoken in a huge area from present-day Poland to the Ural Mountains. Proto Germanic. Homer and the beginning of Classical Antiquity. The Vedic Civilization gives way to the Mahajanapadas. Siddhartha Gautama preaches Buddhism. Zoroaster composes the Gathas, rise of the Achaemenid Empire, replacing the Elamites and Babylonia. Separation of Proto-Italic into Osco-Umbrian and Latin-Faliscan. Genesis of the Greek and Old Italic alphabets. A variety of Paleo-Balkan languages are spoken in Southern Europe. 500 BC–1 BC/AD: Classical Antiquity: spread of Greek and Latin throughout the Mediterranean and, during the Hellenistic period (Indo-Greeks), to Central Asia and the Hindukush. Kushan Empire, Mauryan Empire. Proto-Germanic. 1 BC/ AD 500: Late Antiquity, Gupta period; attestation of Armenian. Proto-Slavic. The Roman Empire and then the Migration period marginalize the Celtic languages to the British Isles. Sogdian, an Eastern Iranian language, becomes the lingua franca of the Silk Road in Central Asia leading to China, due to the proliferation of Sogdian merchants there. The last of the Anatolian languages are extinct. 500–1000: Early Middle Ages. The Viking Age forms an Old Norse koine spanning Scandinavia, the British Isles and Iceland. The Islamic conquest and the Turkic expansion results in the Arabization and Turkification of significant areas where Indo-European languages were spoken. Tocharian is extinct in the course of the Turkic expansion while Northeastern Iranian (Scytho-Sarmatian) is reduced to small refugia. Slavic languages spread over wide areas in central, eastern and southeastern Europe, largely replacing Romance in the Balkans (with the exception of Romanian) and whatever was left of the paleo-Balkan languages with the exception of Albanian. 1000–1500: Late Middle Ages: Attestation of Albanian and Baltic. 1500–2000: Early Modern period to present: Colonialism results in the spread of Indo-European languages to every continent, most notably Romance (North, Central and South America, North and Sub-Saharan Africa, West Asia), West Germanic (English in North America, Sub-Saharan Africa, East Asia and Australia; to a lesser extent Dutch and German), and Russian to Central Asia and North Asia. In reconstructing the history of the Indo-European languages and the form of the Proto-Indo-European language, some languages have been of particular importance. These generally include the ancient Indo-European languages that are both well-attested and documented at an early date, although some languages from later periods are important if they are particularly linguistically conservative (most notably, Lithuanian). Early poetry is of special significance because of the rigid poetic meter normally employed, which makes it possible to reconstruct a number of features (e.g. vowel length) that were either unwritten or corrupted in the process of transmission down to the earliest extant written manuscripts. Vedic Sanskrit (c. 1500–500 BC). This language is unique in that its source documents were all composed orally, and were passed down through oral tradition (shakha schools) for c. 2,000 years before ever being written down. The oldest documents are all in poetic form; oldest and most important of all is the Rigveda (c. 1500 BC). Ancient Greek (c. 750–400 BC). Mycenaean Greek (c. 1450 BC) is the oldest recorded form, but its value is lessened by the limited material, restricted subject matter, and highly ambiguous writing system. More important is Ancient Greek, documented extensively beginning with the two Homeric poems (the Iliad and the Odyssey, c. 750 BC). Hittite (c. 1700–1200 BC). This is the earliest-recorded of all Indo-European languages, and highly divergent from the others due to the early separation of the Anatolian languages from the remainder. It possesses some highly archaic features found only fragmentarily, if at all, in other languages. At the same time, however, it appears to have undergone a large number of early phonological and grammatical changes which, combined with the ambiguities of its writing system, hinder its usefulness somewhat. Latin, attested in a huge amount of poetic and prose material in the Classical period (c. 200 BC – 100 AD) and limited older material from as early as c. 600 BC. Gothic (the most archaic well-documented Germanic language, c. 350 AD), along with the combined witness of the other old Germanic languages: most importantly, Old English (c. 800–1000 AD), Old High German (c. 750–1000 AD) and Old Norse (c. 1100–1300 AD, with limited earlier sources dating all the way back to c. 200 AD). Old Avestan (c. 1700–1200 BC) and Younger Avestan (c. 900 BC). Documentation is sparse, but nonetheless quite important due to its highly archaic nature. Modern Lithuanian, with limited records in Old Lithuanian (c. 1500–1700 AD). Old Church Slavonic (c. 900–1000 AD). Luwian, Lycian, Lydian and other Anatolian languages (c. 1400–400 BC). Oscan, Umbrian and other Old Italic languages (c. 600–200 BC). Old Persian (c. 500 BC). Old Prussian (c. 1350–1600 AD); even more archaic than Lithuanian. Old Irish (c. 700–850 AD). Tocharian (c. 500–800 AD), underwent large phonetic shifts and mergers in the proto-language, and has an almost entirely reworked declension system. Classical Armenian (c. 400–100 AD). As the Proto-Indo-European (PIE) language broke up, its sound system diverged as well, changing according to various sound laws evidenced in the daughter languages. PIE is normally reconstructed with a complex system of 15 stop consonants, including an unusual three-way phonation (voicing) distinction between voiceless, voiced and "voiced aspirated" (i.e. breathy voiced) stops, and a three-way distinction among velar consonants (k-type sounds) between "palatal" ḱ ǵ ǵh, "plain velar" k g gh and labiovelar kʷ gʷ gʷh. (The correctness of the terms palatal and plain velar is disputed; see Proto-Indo-European phonology.) All daughter languages have reduced the number of distinctions among these sounds, often in divergent ways. As in other centum languages, the "plain velar" and "palatal" stops merged, reducing the number of stops from 15 to 12. The voiced stops resulting from the sound shift were softened to voiced fricatives (or perhaps the sound shift directly generated fricatives in these positions). Verner's law also turned some of the voiceless fricatives resulting from the sound shift into voiced fricatives or stops. This is why the t in Latin centum ends up as d in hund(red) rather than the expected th. Most remaining h sounds disappeared, while remaining f and th became voiced. For example, Latin decem ends up as ten with no h in the middle (but note taíhun "ten" in Gothic, an archaic Germanic language). Similarly, the words seven and have have a voiced v (compare Latin septem, capere), while father and mother have a voiced th, although not spelled differently (compare Latin pater, māter). The "central" satem languages (Indo-Iranian, Balto-Slavic, Albanian, and Armenian) reflect both "plain velar" and labiovelar stops as plain velars, often with secondary palatalization before a front vowel (e i ē ī). The "palatal" stops are palatalized and often appear as sibilants (usually but not always distinct from the secondarily palatalized stops). The "peripheral" centum languages (Germanic, Italic, Celtic, Greek, Anatolian and Tocharian) reflect both "palatal" and "plain velar" stops as plain velars, while the labiovelars continue unchanged, often with later reduction into plain labial or velar consonants. The Indo-Aryan languages preserve the three series unchanged but have evolved a fourth series of voiceless aspirated consonants. The Iranian languages probably passed through the same stage, subsequently changing the aspirated stops into fricatives. Greek converted the voiced aspirates into voiceless aspirates. Italic probably passed through the same stage, but reflects the voiced aspirates as voiceless fricatives, especially f (or sometimes plain voiced stops in Latin). Celtic, Balto-Slavic, Anatolian, and Albanian merge the voiced aspirated into plain voiced stops. Germanic and Armenian change all three series in a chain shift (e.g. with bh b p becoming b p f (known as Grimm's law in Germanic). The Ruki sound law (s becomes /ʃ/ before r, u, k, i) in the satem languages. Loss of prevocalic p in Proto-Celtic. Development of prevocalic s to h in Proto-Greek, with later loss of h between vowels. Grassmann's law (dissimilation of aspirates) independently in Proto-Greek and Proto-Indo-Iranian. The following table shows the basic outcomes of PIE consonants in some of the most important daughter languages for the purposes of reconstruction. For a fuller table, see Indo-European sound laws. C- At the beginning of a word. -C At the end of a word. `-C- Following an unstressed vowel (Verner's law). -C-(rl) Between vowels, or between a vowel and r, l (on either side). CT Before a (PIE) stop (p, t, k). CT− After a (PIE) obstruent (p, t, k, etc. ; s). C(T) Before or after an obstruent (p, t, k, etc. ; s). CH Before an original laryngeal. CE Before a (PIE) front vowel (i, e). CE' Before secondary (post-PIE) front-vowels. C(u) Before or after a (PIE) u (boukólos rule). C(O) Before or after a (PIE) o, u (boukólos rule). CR Before a sonorant (r, l, m, n). C(R) Before or after a sonorant (r, l, m, n). C(r),l,u− Before r, l or after r, u.
Cruki− After r, u, k, i (Ruki sound law). C..Ch Before an aspirated consonant in the next syllable (Grassmann's law, also known as dissimilation of aspirates). CE..Ch Before a (PIE) front vowel (i, e) as well as before an aspirated consonant in the next syllable (Grassmann's law, also known as dissimilation of aspirates). C(u)..Ch Before or after a (PIE) u as well as before an aspirated consonant in the next syllable (Grassmann's law, also known as dissimilation of aspirates). The following table presents a comparison of conjugations of the thematic present indicative of the verbal root *bʰer- of the English verb to bear and its reflexes in various early attested IE languages and their modern descendants or relatives, showing that all languages had in the early stage an inflectional verb system. While similarities are still visible between the modern descendants and relatives of these ancient languages, the differences have increased over time. Some IE languages have moved from synthetic verb systems to largely periphrastic systems. In addition, the pronouns of periphrastic forms are in brackets when they appear. Some of these verbs have undergone a change in meaning as well. In Modern Irish beir usually only carries the meaning to bear in the sense of bearing a child; its common meanings are to catch, grab. The Hindi verb bharnā, the continuation of the Sanskrit verb, can have a variety of meanings, but the most common is "to fill". The forms given in the table, although etymologically derived from the present indicative, now have the meaning of subjunctive. The present indicative is conjugated periphrastically, using a participle (etymologically the Sanskrit present participle bharant-) and an auxiliary: maiṃ bhartā hūṃ, tū bhartā hai, vah bhartā hai, ham bharte haiṃ, tum bharte ho, ve bharte haiṃ (masculine forms). German is not directly descended from Gothic, but the Gothic forms are a close approximation of what the early West Germanic forms of c. 400 AD would have looked like. The cognate of Germanic beranan (English bear) survives in German only in the compound gebären, meaning "bear (a child)". The Latin verb ferre is irregular, and not a good representative of a normal thematic verb. In most Romance Languages such as French, other verbs now mean "to carry" (e.g. Fr. porter < Lat. portare) and ferre was only borrowed and nativized in compounds such as souffrir "to suffer" (from Latin sub- and ferre) and conférer "to confer" (from Latin "con-" and "ferre"). In Modern Greek, phero φέρω (modern transliteration fero) "to bear" is still used but only in specific contexts and is most common in such compounds as αναφέρω, διαφέρω, εισφέρω, εκφέρω, καταφέρω, προφέρω, προαναφέρω, προσφέρω etc. The form that is (very) common today is pherno φέρνω (modern transliteration ferno) meaning "to bring". Additionally, the perfective form of pherno (used for the subjunctive voice and also for the future tense) is also phero. In Modern Russian брать (brat') carries the meaning to take. Бремя (br'em'a) means burden, as something heavy to bear, and derivative беременность (b'er'em'ennost') means pregnancy. Today, Indo-European languages are spoken by almost 3 billion native speakers across all inhabited continents, the largest number by far for any recognised language family. Of the 20 languages with the largest numbers of native speakers according to Ethnologue, 10 are Indo-European: Spanish, English, Hindustani, Portuguese, Bengali, Russian, Punjabi, German, French and Marathi, accounting for over 1.7 billion native speakers. Additionally, hundreds of millions of persons worldwide study Indo-European languages as secondary or tertiary languages, including in cultures which have completely different language families and historical backgrounds—there between 600 million and one billion L2 learners of English alone. The success of the language family, including the large number of speakers and the vast portions of the Earth that they inhabit, is due to several factors. 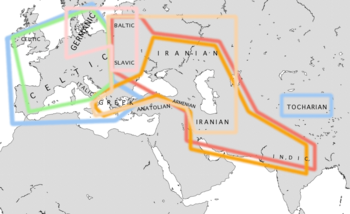 The ancient Indo-European migrations and widespread dissemination of Indo-European culture throughout Eurasia, including that of the Proto-Indo-Europeans themselves, and that of their daughter cultures including the Indo-Aryans, Iranian peoples, Celts, Greeks, Romans, Germanic peoples, and Slavs, led to these peoples' branches of the language family already taking a dominant foothold in virtually all of Eurasia except for North and East Asia by the end of the prehistoric era, replacing the previously-spoken pre-Indo-European languages of this extensive area. Despite being unaware of their common linguistic origin, diverse groups of Indo-European speakers continued to culturally dominate and replace the indigenous languages of the western two-thirds of Eurasia. By the beginning of the Common Era, Indo-European peoples controlled almost the entirety of this area: the Celts western and central Europe, the Romans southern Europe, the Germanic peoples northern Europe, the Slavs eastern Europe, the Iranian peoples the entirety of western and central Asia and parts of eastern Europe, and the Indo-Aryan peoples in the Indian subcontinent, with the Tocharians inhabiting the Indo-European frontier in western China. By the medieval period, only the Vasconic, Semitic, Dravidian, Caucasian and Uralic languages remained of the (relatively) indigenous languages of Europe and the western half of Asia. Despite medieval invasions by Eurasian nomads, a group to which the Proto-Indo-Europeans had once belonged, Indo-European expansion reached another peak in the early modern period with the dramatic increase in the population of the Indian subcontinent and European expansionism throughout the globe during the Age of Discovery, as well as the continued replacement and assimilation of surrounding non-Indo-European languages and peoples due to increased state centralization and nationalism. These trends compounded throughout the modern period due to the general global population growth and the results of European colonization of the Western Hemisphere and Oceania, leading to an explosion in the number of Indo-European speakers as well as the territories inhabited by them. Due to colonization and the modern dominance of Indo-European languages in the fields of global science, technology, education, finance, and sports, even many modern countries whose populations largely speak non-Indo-European languages have Indo-European languages as official languages, and the majority of the global population speaks at least one Indo-European language. The overwhelming majority of languages used on the Internet are Indo-European, with English continuing to lead the group; English in general has in many respects become the lingua franca of global communication. ^ The sentence goes on to say, equally correctly as it turned out: "...here is a similar reason, though not quite so forcible, for supposing that both the Gothic and the Celtic, though blended with a very different idiom, had the same origin with the Sanscrit; and the old Persian might be added to the same family." ^ Hammarström, Harald; Forkel, Robert; Haspelmath, Martin, eds. (2017). "Indo-European". Glottolog 3.0. Jena, Germany: Max Planck Institute for the Science of Human History. ^ Quiles, Carlos (June 2017). "Indo-European demic diffusion model" (PDF) (2nd ed.). Badajoz: Universidad de Extremadura. Retrieved March 24, 2018. ^ "Ethnologue report for Indo-European". Ethnologue.com. ^ Mallory, J. P. (2006). The Oxford Introduction to Proto-Indo-European and the Proto-Indo-European World. Oxford: Oxford University Press. p. 442. ISBN ISBN 9780 199287918 Check |isbn= value: invalid character (help). ^ Bryce, Trevor (2005). Kingdom of the Hittites: New Edition. Oxford University Press. p. 37. ISBN 978-0-19-928132-9. ^ Colin Kidd (2006). The Forging of Races: Race and Scripture in the Protestant Atlantic World, 1600–2000. Cambridge University Press. pp. 23–. ISBN 978-1-139-45753-8. ^ a b c Auroux, Sylvain (2000). History of the Language Sciences. Berlin, New York: Walter de Gruyter. p. 1156. ISBN 978-3-11-016735-1. ^ Beekes, Robert S.P. (2011). Comparative Indo-European Linguistics: An introduction. Second edition. John Benjamins Publishing. p. 12. ISBN 978-90-272-8500-3. ^ "Indo-European Practice and Historical Methodology (cited on pp. 14–15)" (PDF). Retrieved 2010-08-07. ^ Jones, William (2 February 1786). "The Third Anniversary Discourse". Electronic Library of Historiography. Universita degli Studi Firenze, taken from: Shore (Lord Teignmouth), John (1807). The Works of Sir William Jones. With a Life of the Author. III. John Stockdale and John Walker. pp. 24–46. OCLC 899731310. ^ Robinson, Andrew (2007). The Last Man Who Knew Everything: Thomas Young, the Anonymous Genius who Proved Newton Wrong and Deciphered the Rosetta Stone, among Other Surprising Feats. Penguin. ISBN 978-0-13-134304-7. ^ Franz Bopp (2010) . Über das Conjugationssystem der Sanskritsprache : in Vergleichung mit jenem der griechischen, lateinischen, persischen und germanischen Sprache. Documenta Semiotica : Serie 1, Linguistik (2 ed.). Hildesheim: Olms. ^ Kurylowicz, Jerzy (1927). "ə indo-européen et ḫ hittite". In Taszycki, W.; Doroszewski, W. Symbolae grammaticae in honorem Ioannis Rozwadowski. 1. pp. 95–104. ^ Elsie, Robert (2005). "Theodor of Shkodra (1210) and Other Early Texts". Albanian Literature: A Short History. New York/Westport/London: I.B.Tauris. p. 5. ^ In his latest book, Eric Hamp supports the thesis that the Illyrian language belongs to the Northwestern group, that the Albanian language is descended from Illyrian, and that Albanian is related to Messapic which is an earlier Illyrian dialect (Comparative Studies on Albanian, 2007). ^ "2006-05-02 Hittite". www.leidenuniv.nl. 7 July 2017. ^ Güterbock, Hans G. "The Hittite Computer Analysis Project" (PDF). ^ "Tablet Discovery Pushes Earliest European Writing Back 150 Years". Science 2.0. 30 March 2011. ^ Indian History. Allied Publishers. 1988. p. 114. ISBN 978-81-8424-568-4. ^ Mark, Joshua J. (28 April 2011). "Mitanni". Ancient History Encyclopedia. ^ Kruta, Venceslas (1991). The Celts. Thames and Hudson. p. 54. ^ Fine, John (1985). The ancient Greeks: a critical history. Harvard University Press. p. 72. ISBN 978-0-674-03314-6. "Most scholars now believe that the Sicans and Sicels, as well as the inhabitants of southern Italy, were basically of Illyrian stock superimposed on an aboriginal 'Mediterranean' population." ^ Blažek, Václav (2007). "From August Schleicher to Sergei Starostin: on the development of the tree-diagram models of the Indo-European languages". Journal of Indo-European Studies. 35 (1–2): 82–109. ^ Meillet, Antoine (1908). Les dialectes indo-européens. Paris: Honoré Champion. ^ Bonfante, Giuliano (1931). I dialetti indoeuropei. Brescia: Paideia. ^ Porzig, Walter (1954). Die Gliederung des indogermanischen Sprachgebiets. Heidelberg: Carl Winter Universitätsverlag. ^ Nakhleh, Luay; Ringe, Don & Warnow, Tandy (2005). "Perfect Phylogenetic Networks: A New Methodology for Reconstructing the Evolutionary History of Natural Languages" (PDF). Language. 81 (2): 382–420. CiteSeerX 10.1.1.65.1791. doi:10.1353/lan.2005.0078. ^ Mallory, J.P.; Adams, D.Q. (1997). Encyclopedia of Indo-European Culture. London: Fitzroy Dearborn. ^ Porzig 1954, p. 39. ^ Fortson 2004, p. 247. ^ Watkins, Calvert (1966). "Italo-Celtic revisited". In Birnbaum, Henrik; Puhvel, Jaan. Ancient Indo-European dialects. Berkeley: University of California Press. pp. 29–50. ^ Weiss, Michael (2012). Jamison, Stephanie W.; Melchert, H. Craig; Vine, Brent, eds. Italo-Celtica: linguistic and cultural points of contact between Italic and Celtic. Proceedings of the 23rd annual UCLA Indo-European Conference. Bremen: Hempen. pp. 151–73. ISBN 978-3-934106-99-4. Retrieved 2018-02-19. ^ Greppin, James (1996). "Review of The linguistic relationship between Armenian and Greek by James Clackson". Language. 72 (4): 804–07. doi:10.2307/416105. JSTOR 416105. ^ Euler, Wolfram (1979). Indoiranisch-griechische Gemeinsamkeiten der Nominalbildung und deren indogermanische Grundlagen. Innsbruck: Institut für Sprachwissenschaft der Universität Innsbruck. ^ Lubotsky, A. (1988). "The Old Phrygian Areyastis-inscription" (PDF). Kadmos. 27: 9–26. doi:10.1515/kadmos-1988-0103. ^ Renfrew, Colin (1987). Archaeology & Language. The Puzzle of the Indo-European Origins. London: Jonathan Cape. ISBN 978-0-224-02495-2. ^ George S. Lane, Douglas Q. Adams, Britannica 15th edition 22:667, "The Tocharian problem"
^ The supposed autochthony of Hittites, the Indo-Hittite hypothesis and migration of agricultural "Indo-European" societies became intrinsically linked together by C. Renfrew. (Renfrew, C 2001a The Anatolian origins of Proto-Indo-European and the autochthony of the Hittites. In R. Drews ed., Greater Anatolia and the Indo-Hittite language family: 36–63. Washington, DC: Institute for the Study of Man). ^ Britannica 15th edition, 22 p. 594, "Indo-Hittite hypothesis"
^ Holm, Hans J. (2008). "The Distribution of Data in Word Lists and its Impact on the Subgrouping of Languages". In Preisach, Christine; Burkhardt, Hans; Schmidt-Thieme, Lars; et al. Data Analysis, Machine Learning, and Applications. Proc. of the 31st Annual Conference of the German Classification Society (GfKl), University of Freiburg, March 7–9, 2007. Studies in Classification, Data Analysis, and Knowledge Organization. Heidelberg-Berlin: Springer-Verlag. ISBN 978-3-540-78239-1. The result is a partly new chain of separation for the main Indo-European branches, which fits well to the grammatical facts, as well as to the geographical distribution of these branches. In particular it clearly demonstrates that the Anatolian languages did not part as first ones and thereby refutes the Indo-Hittite hypothesis. ^ Kortlandt, Frederik (1989). "The spread of the Indo-Europeans" (PDF). Retrieved 2010-08-07. ^ a b Anthony 2007, pp. 56–58. ^ Ringe 2006, p. 67. ^ Anthony 2007, p. 100. 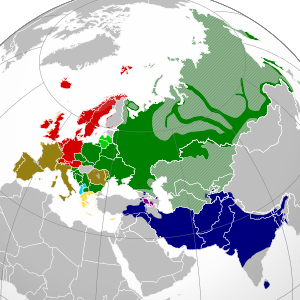 ^ "Indo-European Languages: Balto-Slavic Family". Utexas.edu. 2008-11-10. Archived from the original on 2011-06-04. Retrieved 2010-08-07. ^ Robert S.P. Beekes (2011). Comparative Indo-European Linguistics: An introduction. Second edition. John Benjamins Publishing. p. 30; Skt: 13, Hitt: 20, Gk: 24. ISBN 978-90-272-8500-3. ^ Robert S.P. Beekes (2011). Comparative Indo-European Linguistics: An introduction. Second edition. John Benjamins Publishing. p. 30; Toch: 19, Arm: 20, Alb: 25, 124, OIr: 27. ISBN 978-90-272-8500-3. ^ "Ethnologue list of language families". Ethnologue.com. Retrieved 2010-08-07. ^ "Ethnologue list of languages by number of speakers". Ethnologue.com. Retrieved 2010-08-07. ^ "English". Ethnologue. Retrieved January 17, 2017. ^ "Ten Things You Might Not Have Known About the English Language". Oxford Dictionary. 2015-08-12. Anthony, David W. (2007). The Horse, the Wheel, and Language: How Bronze-Age Riders from the Eurasian Steppes Shaped the Modern World. Princeton University Press. ISBN 978-0-691-05887-0. Auroux, Sylvain (2000). History of the Language Sciences. Berlin: Walter de Gruyter. ISBN 978-3-11-016735-1. Fortson, Benjamin W. (2004). Indo-European Language and Culture: An Introduction. Malden, Massachusetts: Blackwell. ISBN 978-1-4051-0315-2. Brugmann, Karl (1886). Grundriss der Vergleichenden Grammatik der indogermanischen Sprachen (in German). Erster Band. Strassburg: Karl J. Trübner. Houwink ten Cate, H.J. ; Melchert, H. Craig & van den Hout, Theo P.J. (1981). "Indo-European languages, The parent language, Laryngeal theory". Encyclopædia Britannica. 22 (15th ed.). Chicago: Helen Hemingway Benton. Holm, Hans J. (2008). "The Distribution of Data in Word Lists and its Impact on the Subgrouping of Languages". In Preisach, Christine; Burkhardt, Hans; Schmidt-Thieme, Lars; et al. Data Analysis, Machine Learning, and Applications. Proceedings of the 31st Annual Conference of the German Classification Society (GfKl), University of Freiburg, March 7–9, 2007. Heidelberg-Berlin: Springer-Verlag. ISBN 978-3-540-78239-1. Kortlandt, Frederik (1990). "The Spread of the Indo-Europeans" (PDF). Journal of Indo-European Studies. 18 (1–2): 131–40. Lubotsky, A. (1988). "The Old Phrygian Areyastis-inscription" (PDF). Kadmos. 27: 9–26. doi:10.1515/kadmos-1988-0103. Kortlandt, Frederik (1988). "The Thraco-Armenian consonant shift". Linguistique Balkanique. 31: 71–74. Lane, George S.; Adams, Douglas Q. (1981). "The Tocharian problem". Encyclopædia Britannica. 22 (15th ed.). Chicago: Helen Hemingway Benton. Renfrew, C. (2001). "The Anatolian origins of Proto-Indo-European and the autochthony of the Hittites". In Drews, R. Greater Anatolia and the Indo-Hittite language family. Washington, DC: Institute for the Study of Man. ISBN 978-0-941694-77-3. Schleicher, August (1861). Compendium der vergleichenden Grammatik der indogermanischen Sprachen (in German). Weimar: Böhlau (reprinted by Minerva GmbH, Wissenschaftlicher Verlag). ISBN 978-3-8102-1071-5. Szemerényi, Oswald; Jones, David; Jones, Irene (1999). Introduction to Indo-European Linguistics. Oxford University Press. ISBN 978-0-19-823870-6.
von Bradke, Peter (1890). Über Methode und Ergebnisse der arischen (indogermanischen) Alterthumswissenshaft (in German). Giessen: J. Ricker'che Buchhandlung. Beekes, Robert S.P. (1995). Comparative Indo-European Linguistics. Amsterdam: John Benjamins. Chakrabarti, Byomkes (1994). A comparative study of Santali and Bengali. Calcutta: K.P. Bagchi & Co. ISBN 978-81-7074-128-2. Collinge, N.E. (1985). The Laws of Indo-European. Amsterdam: John Benjamins. Mallory, J.P. (1989). In Search of the Indo-Europeans. London: Thames and Hudson. ISBN 978-0-500-27616-7. Renfrew, Colin (1987). Archaeology & Language. The Puzzle of the Indo-European Origins. London: Jonathan Cape. ISBN 978-0-224-02495-2. Meillet, Antoine. Esquisse d'une grammaire comparée de l'arménien classique, 1903. Ramat, Paolo; Ramat, Anna Giacalone (1998). The Indo-European languages. Routledge. Schleicher, August, A Compendium of the Comparative Grammar of the Indo-European Languages (1861/62). Strazny, Philip; Trask, R.L., eds. (2000). Dictionary of Historical and Comparative Linguistics (1 ed.). Routledge. ISBN 978-1-57958-218-0. Szemerényi, Oswald (1957). "The problem of Balto-Slav unity". Kratylos. 2: 97–123. Watkins, Calvert (2000). The American Heritage Dictionary of Indo-European Roots. Houghton Mifflin. ISBN 978-0-618-08250-6. Remys, Edmund, General distinguishing features of various Indo-European languages and their relationship to Lithuanian. Berlin, New York: Indogermanische Forschungen, Vol. 112, 2007. P. Chantraine (1968), Dictionnaire étymologique de la langue grecque, Klincksieck, Paris. Wikimedia Commons has media related to Indo-European languages. Wikisource has the text of the 1911 Encyclopædia Britannica article Indo-European Languages. Dyen, Isidore; Kruskal, Joseph; Black, Paul (1997). "Comparative Indo-European". wordgumbo. Retrieved 13 December 2009. "Indo-European". LLOW Languages of the World. Retrieved 14 December 2009. "Indo-European Documentation Center". Linguistics Research Center, University of Texas at Austin. 2009. Archived from the original on 3 September 2009. Retrieved 14 December 2009. Lewis, M. Paul, ed. (2009). "Language Family Trees: Indo-European". Ethnologue: Languages of the World, Online version (Sixteenth ed.). Dallas, Tex. : SIL International. .
"Thesaurus Indogermanischer Text- und Sprachmaterialien: TITUS" (in German). TITUS, University of Frankfurt. 2003. Retrieved 13 December 2009. "Indo-European Lexical Cognacy Database (IELex)". Max Planck Institute for Psycholinguistics, Nijmegen. "Indo-European Etymological Dictionary (IEED)". Leiden, Netherlands: Department of Comparative Indo-European Linguistics, Leiden University. Archived from the original on 7 February 2006. Retrieved 14 December 2009. "Indo-European Roots Index". The American Heritage Dictionary of the English Language (Fourth ed.). Internet Archive: Wayback Machine. August 22, 2008 . Archived from the original on February 17, 2009. Retrieved 9 December 2009. Köbler, Gerhard (2014). Indogermanisches Wörterbuch (in German) (5th ed.). Gerhard Köbler. Retrieved 29 March 2015. Schalin, Johan (2009). "Lexicon of Early Indo-European Loanwords Preserved in Finnish". Johan Schalin. Retrieved 9 December 2009. This page was last edited on 19 April 2019, at 11:35 (UTC).